This past week, many DIY investors have been turning their attention to ways to spend their money rather than to grow it. Although online traders have typically avoided coming to blows with each other over discounted vegetable steamers, online trading is most definitely a fierce battle to get a deal that can be monetized by selling to someone further down the line. Undoubtedly there have been and will forever be expletives hurled at screens of all sizes when orders or trades don’t go as planned. Luckily those screens don’t talk (at least not for the moment). For Canada’s discount brokerages, this past week they’ve done their best to score some time in the news cycle for much more positive reasons. In this edition of the roundup we take a look at one bank-owned brokerage’s three-peat in the winner’s circle for an online brokerage award. Next we take a look at what a survey from Canada’s largest online brokerage has to say about the future of DIY investing in Canada. We then focus on the latest tweets of the week and gather some interesting investor commentary from the forums. As one of Canada’s most visible bank-owned brokerages, BMO InvestorLine continues to find the awards spotlight. For the third consecutive year, this Canadian discount brokerage was recognized by the Morningstar Canada awards as being Canada’s best discount brokerage. In what areas have you differentiated your business from that of your peers? Emphasis should be placed on developments and upgrades introduced within the past 1-2 years. Your submission should discuss any particular segments of the market targeted by your firm and how these are being reached. Of note, the Morningstar awards for best online brokerage are structured around several of the criteria used in the Surviscor discount brokerage rankings. Surviscor also helps to provide research and contributes to the MoneySense brokerage rankings. These also happen to be the rankings in which BMO InvestorLine has finished at or near the top of, and so it seems that BMO InvestorLine has maintained their strong showing throughout the year. For BMO InvestorLine, the third consecutive victory also falls at the third anniversary mark of their advice-direct platform – something that hasn’t garnered nearly the same recognition or attention as their DIY investing arm has. As we head into the end of the year, there is still one more major brokerage ranking (the Globe and Mail 2015 discount brokerage ranking) to go. For DIY investors, it will be interesting to compare the results from the Globe’s rankings as they represent a very different approach than the Surviscor/MoneySense/Morningstar rankings. Historically, BMO InvestorLine has also performed well in those rankings however unlike the Morningstar awards, there is no submission fee to be evaluated. With free admission, the field is bound to be more crowded and therefore tougher to outshine. In spite of all the talk of competition between brokerages, it seems that a recent study commissioned by TD Direct Investing suggests the pool of Canadian DIY investors will continue to expand. 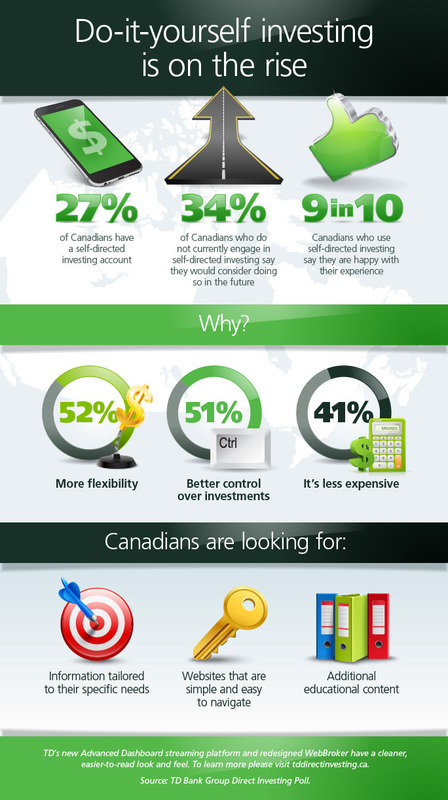 Results of recent survey of 1750 Canadian DIY investors this past September provided a number of compelling insights, many of which are summarized in the infographic below. Aside from the finding that that the number of investors who are managing at least part of their investments could double within the next 10 years, it was what investors reported was still lacking on the part of the online brokerage providers that might touch off a wave of features in the near future. One of those items DIY investors reported was that websites are ‘too complex’ to navigate. This is particularly timely given the number of new website releases that have taken place this year, with a handful more in the pipeline. TD Direct Investing also recently revamped their website with a decidedly simpler front end. Another item that stood out was that only 7% of users polled preferred to use their smartphone for DIY investing. While stats were not provided for tablet users, this number is expected to grow now that the technology, internet connections and user interfaces/apps have matured. There are still features, such as charting and research, which are going to be challenging to do efficiently on a small screen, however the mobile trading experience today is drastically different than it was even just 2 years ago. That said, a quick look at the discount brokerage tweets for the past several weeks would show that that there is a divergence between theory and reality when it comes to mobile trading sites and apps. For Canadian DIY investors, there is clearly an interest in taking a more hands on approach to managing their financial futures. With the upcoming fee disclosure changes coming to the advisor world and a tough year for Canadian equities, there might be additional momentum towards considering the benefits of DIY investing as investors take a closer look at what their fees are earning them. And, although several brokerages have already undertaken major redesigns of their website in anticipation of the new ways investors are hoping to interact with their products, the biggest challenge confronting brokerages will be to provide experiences to investors that truly meet their diverse needs. This week’s tweets feature a mixture of highs and lows. For DIY investors, the word of the week was ‘frozen’ (trading apps that is) and unlike Elsa and Anna, they did not let it go. Mentioned this week are BMO InvestorLine, CIBC Investor’s Edge, Questrade, Scotia iTrade, TD Direct Investing and Virtual Brokers. As any investor knows, it takes money to make money. Of course, nobody specified exactly whose money it has to take in order to make that next return. In this post from RedFlagDeals’ investing forum, it was interesting to note one DIY investor’s experience trying to trade an RBC Direct Investing account without funds in the source account. Paperwork (and lots of it) is usually synonymous with DIY investing. Of course for anyone trading with US securities this only becomes even more of a challenge. In this post, one user with multiple brokerage accounts at several big brokerages has the onerous task of keeping the regulatory powers that be apprised of their financial and citizenship status. That’s a wrap for this week’s roundup. Best of luck hunting great deals as cyber Monday promises another day of marketing madness and some great bargains. Of course, one savvy retail experiment shows that even if you promise nothing, people are still willing to pay.